Looking simultaneously modern (sci-fi, even) and fabulously retro (those finger faves), Cara Delevingne — in a see-through metal gown — took our breath away at the premiere of her latest film, Valerian, this week in Los Angeles. Designer Iris van Herpen is behind the futuristic gown, one of 18 from her “Aeriform” collection. The pieces in the collection are a rumination on the relationship and contrast between air and water, and were inspired by the Danish underwater artists Between Music. “Their liquid voices and the subsonic darkness from Between Music overwhelmed me. It motivated me to dive into the contrasts between water and air, between inside and outside, between darkness and lightness,” van Herpen explained in a statement. Take a look at the stunning, nearly sheer creation on Delevingne. And here it is on the runway earlier this month at Paris Couture Week. The gown’s feather-light metal lace was designed in collaboration with Toronto-based architect Philip Beesley, and involves 3-D printing and laser cutting. This collection marks the 10th time the two artists have worked together. 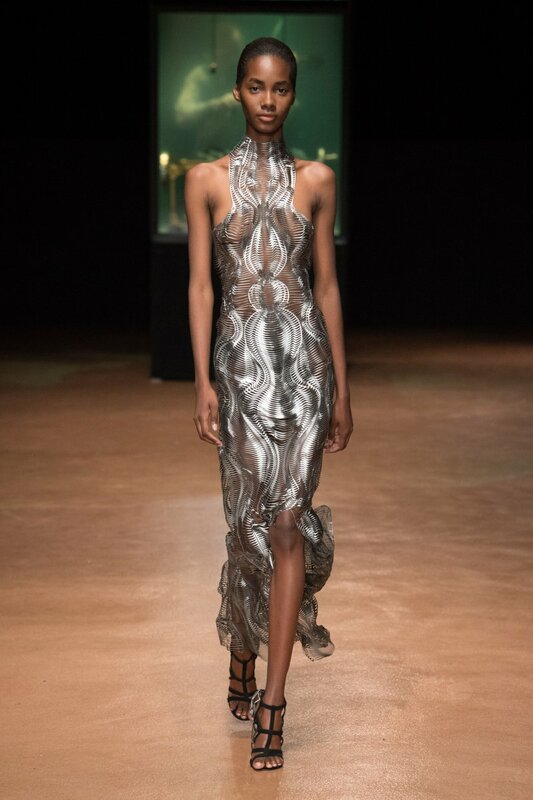 And those underwater musicians who inspired van Herpen? Just listen to their haunting music and you’ll understand the designer’s motivation precisely. As for Delevingne, she stars in the film as Laureline, a space- and time-traveler who, with her partner and paramour Valerian, works to protect the universe from an unknown enemy. Valerian hits theaters around the country this Friday, July 21st, and is sure to delight even those who have no interest in science fiction (did we mention Rihanna makes an appearance? Yeah, you’re convinced now, aren’t you?). Go see it!